Aprende sobre la creciente cultura de cerveza artesanal de Charlotte. Disfruta de la música en vivo en cada lugar. 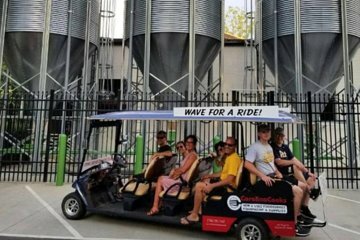 This is basically just a nice guy driving you to three breweries (in a golf cart). Something to do if you have a free afternoon and you like beer tasting. I realized after that we were supposed to get a free drink at each brewery, which we didn’t get.